When designing and building the Disney parks, the Imagineers put so much detail into everything they do, down to the most miniscule detail. Some so miniscule that they sometimes go unnoticed to the untrained eye. 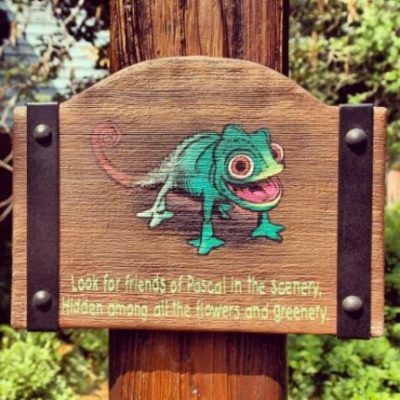 We know about the Hidden Mickey’s around the park, but did you know about the Hidden Pascal’s at Magic Kingdom? Pascal is Rapunzel’s sidekick in the Disney movie Tangled. As her only companion for most of her upbringing, he is one of the driving forces behind Rapunzel leaving her tower. 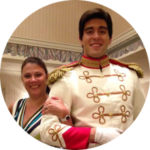 He is expressive and protective of Rapunzel as they venture out into the unknown and will quickly wiggle his way into your heart. In 2013 as Disney continued to expand Fantasyland, they revealed the Tangled restroom area. In all seriousness, it is by far the most wonderful restroom on Disney property! If you find yourself there, which you should by the way, you’ll find details from the movie including frying pans, Maximus hoof prints, Flynn Rider’s satchel, beautiful paintings, and Pascal along with some of his friends. Actually, you’ll have to find Pascal and his friends, and admittedly, it is a bit of a challenge! Located around the restroom area (not in the actual restrooms) are hidden chameleons. There are reportedly 10 total. Since learning of them, I have looked and looked and only successfully found one! Doing some research for this article, I now know the location of six. How many have you found? Post pictures in the comments below!